Ryan Cayabyab shares the story about how he originally formed Smokey Mountain 30 years ago. 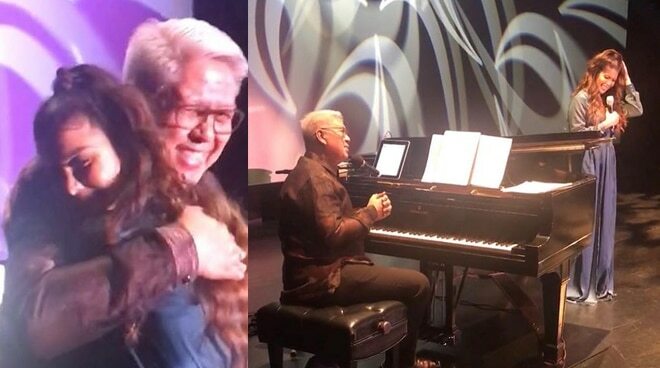 In her latest Instagram post, Geneva Cruz shared her latest performance which reunited her with National Artist for Music Ryan Cayabyab. Before they performed, the OPM icon shared the story behind how he discovered Geneva and formed the singing group Smokey Mountain. “Smokey Mountain would have been 30 years together already. In 1989, we had a huge audition. We were looking for pre-teens and I think about a thousand auditioned. We found eight finalists and we got four. The original four including Tony Lambino, James Coronel, Jeffrey Hidalgo, and Geneva Cruz,” Ryan said. Before coming out with their hit songs “Kailan,” “Can This Be Love,” “Not All The World is America,” and “Mama,” Ryan shared the story behind the group’s name. “The first thing we did when we had the group completed, we all went to Smokey Mountain in Tondo. We all went up the garbage heap. It’s a mountain. Ang baho grabe. Sobra. To the point that the next day when we entered the car, it still smelled that way. But now you won’t find the Smokey Mountain anymore because they built a new housing for the less privileged members of our society,” he recalled. Before starting their performance of “Mama,” Ryan admitted it was an emotional process for him. “I distinctly remember having written this song in 1989. I was crying when I was writing this song because I remembered all our mothers, all our titas, all our grandparents who have to work outside the country so they can send money to their apo, to their children, so that they can have a better life. This is a song that also won for Geneva Best Performer in the Voice of Asia in 1992,” he added.